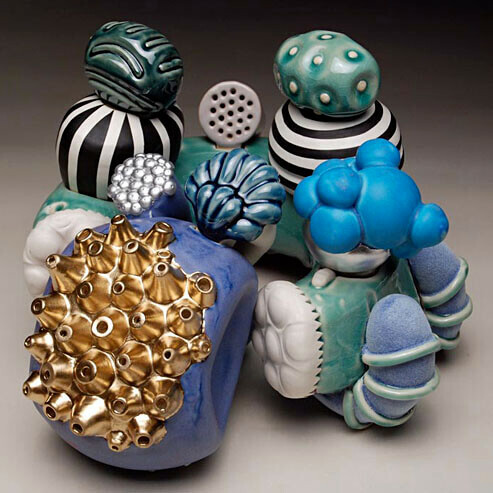 The ceramic sculptures that I create explore a number of parallels, the most prominent being the grapple between organic matter and ordinary manufactured objects. As humans, we interact with biological things and machine-made items on a daily basis, especially in a tactile sense: elevator buttons are pushed, trees are climbed, doorknobs are turned, and flowers are picked. In my sculptures, I reference forms from both of these groups to draw attention to this day-to-day contact. My interest lies in the beauty and notability of a cluster of berries, or the dial on a stereo. The interactivity of my work also branches from this interest in the everyday: supple rubber coating, slippery-smooth glazes, velvety flocking, fluid spray paint and the roughness of raw porcelain all call to textures that our hands have caressed before. The context of the adult-sized sandboxes that the sculptures are often displayed in endorses them to be touched and played with freely. This also allows them to be explored and experienced indiscriminately, by people of all ages. In this way, my work provides a re-exploration of the world around us. Lines are blurred between adulthood and childhood, familiarity mixes with foreignness, and the traditional rules about keeping a safe distance from a work of art become broken. The results are engrossing assemblages of ceramic parts. Where on one side there’s creamy lilac glaze, the piece nesting on top of it has boisterous rubber coating running down the side. Where one part is sided by cushy black flocking, another spiky removable piece is slippery with gold spray paint. Where one piece tugs on a memory of a familiar shiny bike chain, the idea is interrupted by another shape that seems to be something vital and spongy pulled off of the ocean floor.